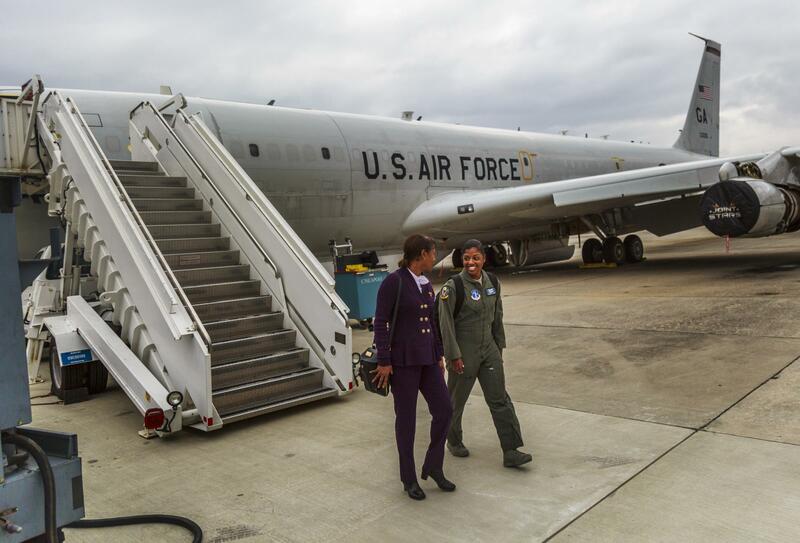 First Lieutenant Andrea Lewis will be the first black woman to deploy with the Georgia Air National Guard. Andrea Lewis said that, as a pilot, her favorite part of flying is actually putting the aircraft back on the ground. Soon, 1st Lt. Andrea Lewis will add an active duty deployment to her travels. When that happens, she will be the first African American woman to deploy with the Georgia Air National Guard. By “this jet,” Lewis means the repurposed Boeing 737. In the configuration in which she flies it, the aircraft is the aerial surveillance, battlefield monitoring and command and control platform for the U.S. Air Force Joint Surveillance Target Attack Radar System, or JSTARS, program based at Robins Air Force base in central Georgia. The JSTARS have been a fixture of wars in the Middle East and Afghanistan. Lewis will deploy, in Air Force parlance, to Southwest Asia. Lewis said she was inspired to fly by her father who was a career pilot with American Airlines. Most pilots start flying in their teens, but Lewis, 31, only started flying in her twenties when she was already well into a career as a Delta Airlines flight attendant. Georgia Air National Guard First Lieutenant Andrea Lewis, right, leaves the aircraft on which she will soon deploy with her mother Sharon Pierrie Scott at Robins Air Force Base in Warner Robins. Sharon Pierrie Scott is Lewis’ mother and, like Lewis, is a Delta Air Lines flight attendant. Scott said Lewis was very close to her father. When he died unexpectedly from complications from diabetes, Scott said her daughter took the loss very hard before converting her grief into a sense of purpose and new direction for her life. Scott said she takes a measure of pride in her daughter’s resilience. Lewis has advice for aspiring pilots who may look at something the size of what Lewis flies and think there’s no way they could get there. That’s advice that probably works outside of aviation, too.